I wish that they would up the habitat levels because I just bought my second upgrade habitat for 100 gems (I don't plan on spending more than that for more habitats) it was a second dark giant habitat and 25 on top of the upgrade fee. I didn't want to spend DC as I'm saving for island 9. I would love some more room! Reposted. Ugh autocorrect is a nightmare! Just bred all four new dark hybrid dragons. Now I have every single dragon in the game. Level one lapis dragon.So cute! Agree the baby Lapis is adorable! Welcome! So many lovely dragons to choose from... but it would have to be Sapphire. I like my naps every now and then. Hi Macky, and welcome! Feels kind of personal, eh? I really LOVE the moon dragon. Somehow I bred two suns but I'll get you moon dragon! I also wouldn't mind being the paper dragon. Moon is cute, but I am not so sure about being paper. I sneeze enough in real life. To be a sneezy dragon would be irksome. Especially one that floats backwards with every sneeze. Paper is one of my favorites. I don't think it sneezes (Pollen sneezes), its's roaring and jumping backwards. I have always interpreted paper as being blown back by the force of its blast. I see it as a sneeze as I feel I sneeze that forcefully. I cannot use paper tissues as I just blow a hole in them. I DO love the look of paper though. Allergies can be a cruel thing. I love Heat Dragon, he's so cool ! I definitely like this new Prism dragon. It looks beautiful and at the same time fearless. Not sure if this is a pick or what you would be according to personality, but id like to be a wind dragon. Just cute, throughout all three ages, and ive always wanted to fly. Of course, if it wa just based on me, think of th most ridiculous, stupid, loser like dragon you know. Yeah, thats me. Don't be so hard on yourself. Wind dragon sounds just great! 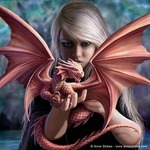 There are many reasons for WANTING to be a dragon and why such choices would be ideal. I couldn't begin to answer those if I tried. 1. The baby reminds me of Rotta the Hutt - cutest little disgusting creature I know in fiction. 2. But... I like those huge, deep, dark eyes (kinda like me). 3. I'd be a water dragon in any case: I love swimming, was a frustrated high diver and an even more frustrated sync swimmer. That said, I'd also love to fly. Such a hard decision to pick just one. Probably Bouquet as I love flowers and the warmth of Springtime.